About 8 years ago at the height of the famed internet rap blog era, Harlem native A$AP Rocky arrived on the scene with “Purple Swag.” Drawing heavily from the school of DJ Screw, the track was the product of the Internet in which hip-hop niche sounds became region-less, and influences from afar were able to be reciprocated authentically. Fast-forward to 2018 - some would argue A$AP Rocky has put music on the backburner in favor of other creative ventures such as fashion, acting, and an art exhibition. But at a sold-out Anthem, A$AP Rocky reminded the crowd of his biggest strength - putting on the show of a lifetime. By naming his latest album Testing, A$AP Rocky signaled that he was taking fans on a detour from his previous three records. The sonic and visual experimentation present in Testing’s translated to the stage production for his tour. 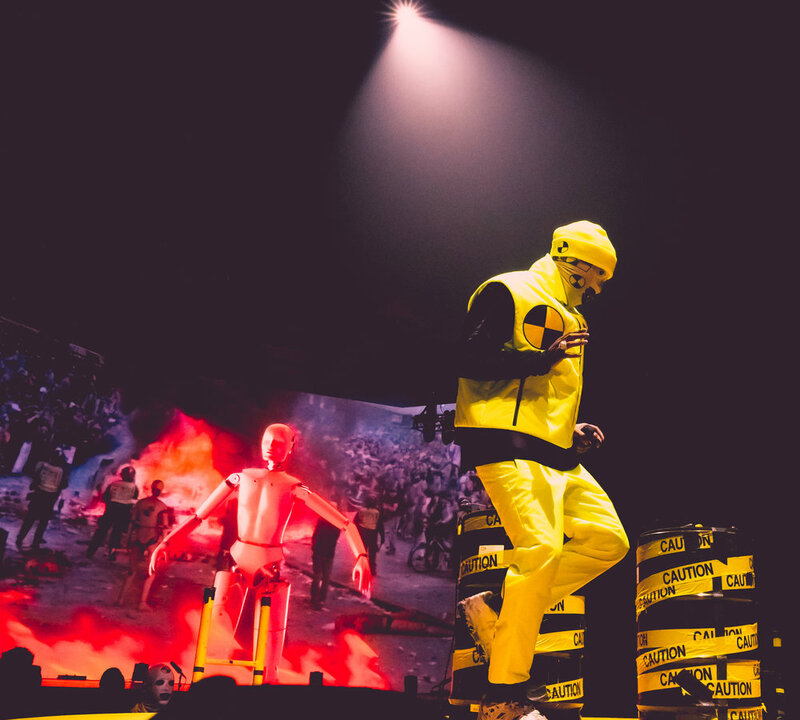 The loud contrast of black and yellow from caution tape served as inspiration from the stage design, which was splashed on the main stage, to A$AP Rocky’s clothing choices, decked out in a crash test dummy mask and donning a Prada vest with a massive crash test logo. Two hypemen entered the venue with signs that demanded concertgoers be ready to mosh. A$AP Rocky opened his set with “A$AP Forever,” playing out like a victory lap that reflected on his career and his impact on hip-hop culture thus far. The second song of the set, “Yamborghini High,” paid respects to the founder of the A$AP Mob, A$AP Yams, and carried over the intense momentum present from the very start of the show. The production throughout the show was a visual spectacle that perfectly represented A$AP Rocky’s aesthetic. On “Gunz N Butter,” which features Memphis hip-hop legend Juicy J, A$AP Rocky rapped atop a Mercedez Benz car floating in midair. Fireworks and towering smoke punctuated most songs. Red spotlights shone on him at center stage as he performed the intro of “Distorted Records” on an MPC, an obvious nod to Kanye West. The performances of his two most psychedelic cuts in his discography, “LSD” and “Kids Turned Out Fine,” were complemented by hallucinatory effects atop of a rotating smiley face on the main screen. The most extravagant visual of the night came in the form of confetti that dropped during “Wild for the Night.” However, this only ensued after ten solid minutes of A$AP Rocky demanding a grand mosh pit from the crowd, which hurt the momentum he had thus far in the show. He restored the hype by covering “R.I.P.” and “Plain Jane,” songs from fellow AWGE/A$AP Mob cohorts Playboi Carti and A$AP Ferg, songs that he admits turning up to. By the night's end, A$AP Rocky proved that his creativity isn’t limited to just the music - combined with some impressive visuals and his on-stage energy, fans left just as hyped-up as they did when they entered The Anthem. A$AP Rocky’s latest album Testing is available now and the Injured Generation Tour continues. Comethazine opened up A$AP Rocky’s show at The Anthem.